Spark Exhaust Technology Kawasaki Ninja 400 Titanium "Konix" Full Exhaust System. Titanium silencer with stainless mid-pipe and racing header. 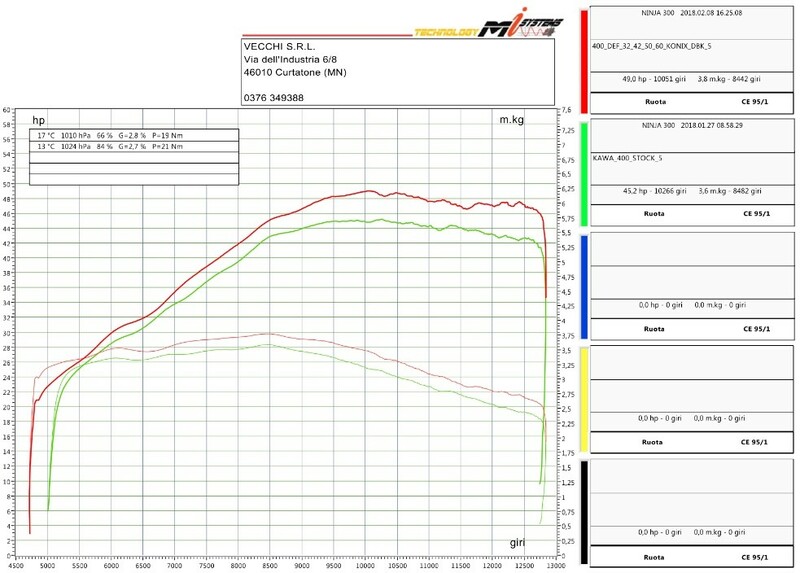 Handcrafted in Italy, Approximately 6 lbs, Dyno Tested for maximum horsepower increase over stock, 108 db. Non-Homologated Racing Version for Maximum Performance. Warning: neither Spark, Vecchi SRL, or MOTO-D make any representation that the products comply with the air and/or noise emissions laws, or labeling laws, of any jurisdiction. The purchasers are entirely responsible for informing themselves of the applicable laws where the products are to be used and to comply with those laws. Emissions Warning / USA: Various U.S. states and the U.S. federal government have individual laws regulating the use of aftermarket exhaust parts and systems, especially as those parts and systems modify, remove, or replace original equipment catalysts. Please consult the appropriate laws in your area before installing any aftermarket part or system on your vehicle to ensure compliance with all applicable laws. Neither Spark, Vecchi SRL, or MOTO-D or the sellers of the parts or systems make any representation that any of their parts or systems comply with any such laws. Warning / California: California laws prohibit the use of any aftermarket exhaust part or system that modifies, removes or replaces original equipment catalysts unless the California Air Resources Board has issued an Executive Order regarding such part or system or unless the part or system is exempted by being used only on racing vehicles on closed courses. Neither Spark, Vecchi SRL, or MOTO-D make any representation that any of their parts or systems has received such an Executive Order or that any of their parts or systems conform with the racing vehicles exemption. The purchasers are entirely responsible for informing themselves of applicable California laws and to comply with those laws. Click the button below to add the Spark Kawasaki Ninja 400 Titanium "Konix" Full Exhaust System to your wish list.